Adobe, the company that has effectively become the authority on digital media creation, recently released their family of Touch Apps for Android. This release brought six amazing tools to the hands of design professionals everywhere, enabling incredibly breezy, fluid creation, editing, and concept workflow experiences for just $10.00 a pop. Perhaps more impressive than the apps themselves is Adobe's Creative Cloud. The Creative Cloud is essentially a cloud storage space, which allows users to upload and download content, to and from tablets or desktop machines. Each user gets 20GB of free storage, and Adobe's Touch Apps can pull almost all of Adobe's file formats, including Illustrator files, PDFs, PSDs, etc. As promised, I've spent some time with each of these apps, and I've prepared a series of in-depth reviews, meant to give readers an overall idea of what it's like to use each of Adobe's new apps. You'll probably notice the words "like the other Touch Apps," coming up a lot in these reviews. This is because the overall experience in this family of apps is incredibly cohesive, and they all work together perfectly. To start things off, let's discuss Kuler. 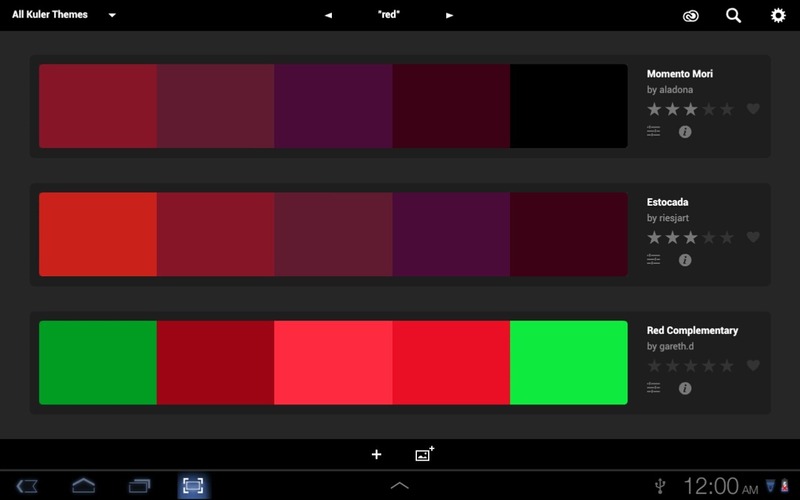 Besides the Creative Cloud, Adobe Kuler is one of the most integral (and useful) aspects of the new family of Touch Apps, bringing surprising versatility for an app centered around color scheming. Not only is the app itself extremely handy, but the themes created in it can be used in some of Adobe's other apps, ensuring a cohesive aesthetic across all your projects. This Touch App is actually an adaptation of an online tool by Adobe that's been around for a while, but is different in that it belongs to the family of Touch Apps, and makes use of the Creative Cloud, two critical points that really take Kuler from a mere online tool to a full fledged, useful application. 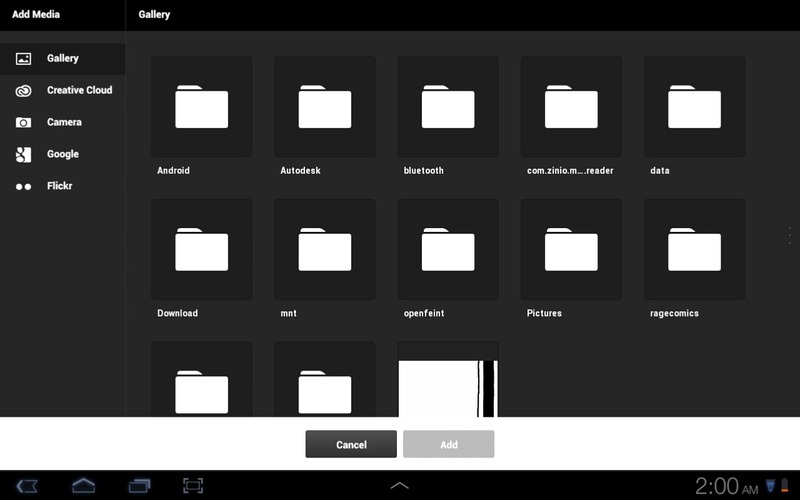 Kuler is, no doubt, one of the best apps in Adobe's collection for Android. It appears at first glance to be a simple color wheel, but the features and functionality packed in to its small 10MB footprint are incredible and useful. 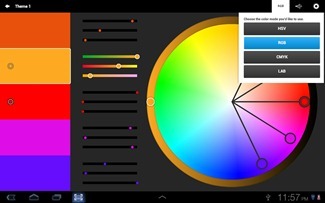 The interface, in keeping with the rest of Adobe's Touch Apps, is sleek, intuitive, and really well-done. The experience is consistent with the other apps, which is critical when working with design software. 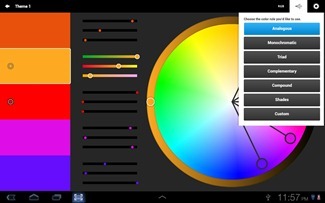 If I had to find fault with the app, it would be that its themes can't be used with Photoshop Touch. Unlike Adobe Ideas, PS Touch can't pull Kuler themes for quick, gestural designs. This may be more of a problem with PS Touch, but with all the things Kuler can do, it would be nice to see its compatibility expanded all the way. Upon opening Kuler, you'll be greeted with a color wheel, various sliders, and big panels of color, representing the current scheme. The bubbles connected to the center of the color wheel can be adjusted freely, changing the color scheme and dynamically adjusting up to five hues at once. 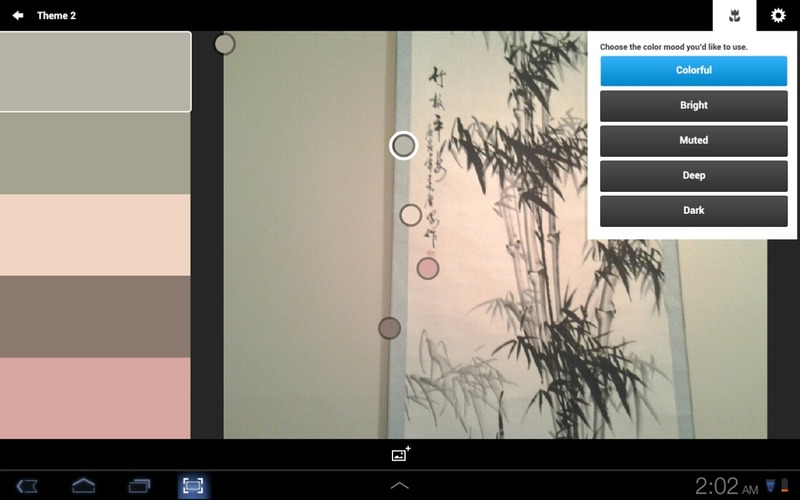 Fine-tune adjustments can be made for each hue using the sliders to the left. Kuler allows the user to choose which sliders to display, effectively allowing you to work in different color modes, including RGB, CMYK, HSV, and Adobe Lab Color. Additionally, the user can choose what kind of scheme to create. Analogous, monochromatic, triad, complementary, and more options are all available, allowing for great versatility. 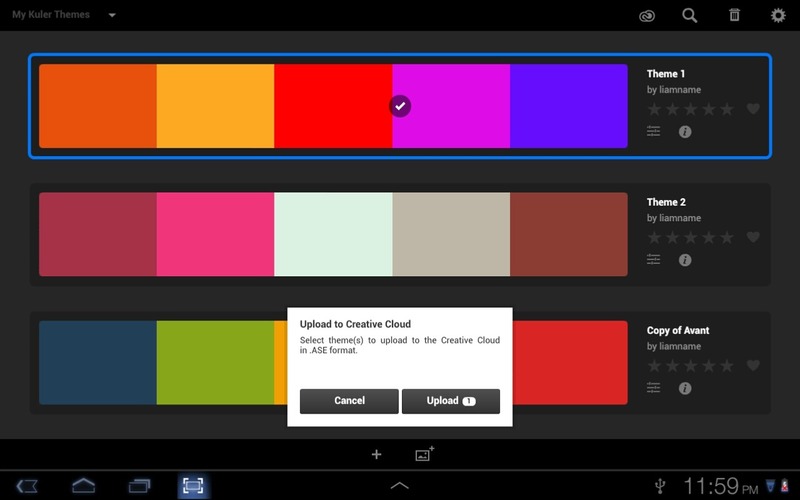 As with Adobe's other Touch Apps, Kuler has great Creative Cloud integration. Users can not only upload to the cloud, but can also pull their own themes, or themes created by others. This means that if you're not feeling particularly inspired, you can have a look at themes that others have uploaded, pull one to your device, and adjust it to your tastes. This is genius, as it allows for a great range of possibilities, and gives users the opportunity to pull inspiration from other artists on the go. 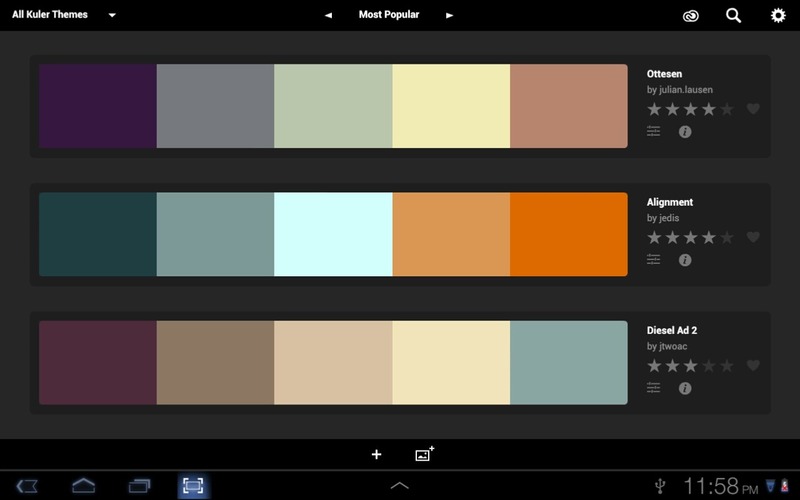 Another great feature when searching through user-generated palettes, is that you can search by color. This means that if you search for "red," Kuler will look for red schemes, or those that include red hues. 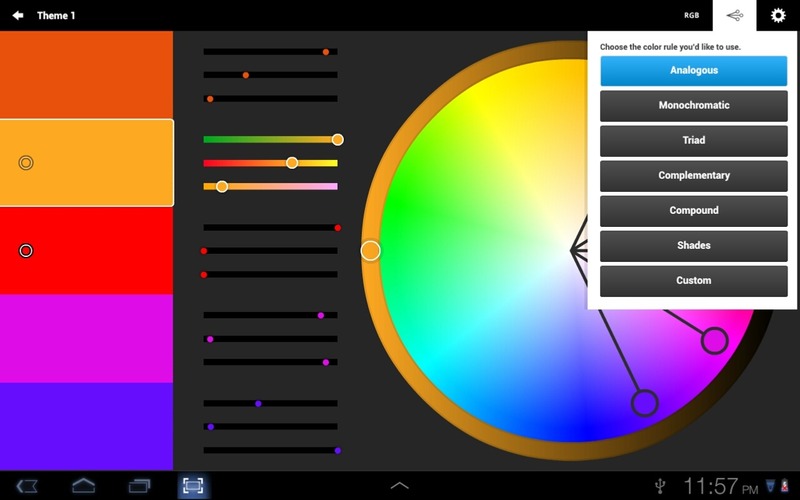 One more feature worth mentioning is the ability to create color schemes based on images. Like with the other apps in the family, Kuler lets you choose from a variety of sources: the cloud, a Google search, your own device's gallery, or even a photo. The ability to create schemes based on photos is unique to Kuler, and is one of the things that makes it amazing. Not only will Kuler pick out the crucial hues from any photo, but it will allow you to choose what type of scheme you want, adjusting accordingly. As brilliant as Kuler is, it's not totally unique. MyPantone, for example, is a great color management/scheming app, but I would argue that without the cloud connectivity and integration with other design apps that Kuler boasts, the competition simply doesn't hold up. My overall conclusion, if you couldn't already tell, is that Kuler is awesome. For someone like me, who is obsessed with getting colors right and having color-pairings that work and look good, Kuler is completely satisfying. Even if you aren't a professional designer, or aren't exactly involved in producing visual images, Kuler can be useful. I could easily see this app - used in conjunction with Adobe Ideas - applied to interior design, landscaping, and a variety of other tasks that both professionals and everyday users engage in. It is, overall, a well-rounded, polished, extremely useful app, particularly when paired with the rest of the Touch Apps family, and is well worth the $10.00 investment.